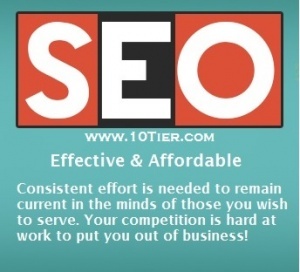 10Tier.com is the leading New York City SEO Company providing local NYC SEO services to companies that want to not only compete for first page Google rankings but that want to organically dominate the local search market. Yes we said “organically dominate the local search market”, and we can show you companies we do just that for. SEO Keyword Research – we provide our customers with detailed research of your industry and competitors and recommend which keywords and search phrases should be focused on to help you organically rank and dominate the search engines. As your website and business grows we will continue to evolve your SEO strategy for maximum SEO ROI. SEO Strategy – we will review your business, your goals, your ability to handle the influx of traffic as a result of our SEO services and your website to layout a customized SEO strategy that will help you to continue to grow your business online. SEO Implementation and Management – once we do the research and develop you a customized SEO strategy we will implement and manage all of the SEO services for you, allowing you to focus on your business. To many businesses get into the business of SEO and neglect their business because they want to do it all themselves. That’s great if you want to become an SEO expert, but if you want your business to grow and flourish don’t try and do it all yourself, let our NYC SEO experts do it for you. Why work with our New York City SEO Company? One reason is that we do all the work ourselves. We do not outsource overseas, never use black hat tactics, or cut corners to ‘play’ the search engines, putting you at risk. All work is performed in-house by our team of NYC SEO professionals. Also we guarantee our SEO services will work. Most SEO companies would NEVER put this in writing, but we have a 100% money back guarantee that our SEO services will increase your organic search engine rankings! Another great reason to partner with our New York City SEO company is that we provide affordable SEO services. This is important because as you’re business grows you can increase your SEO budget, but until then we’ll help you get there with affordable SEO services based on your current budget needs. New York City is the greatest City in the world and we’re happy to live, work, and serve our customers here. Local NYC Local Search Profiles – creation or claiming of your business listings in the top local search engine directories including: Google Places/Maps, Bing Local, Yahoo! Local, Yelp and many others. Custom SEO Consulting – As a full service NYC SEO client we realize that your needs can change daily and we are flexible enough to change direction as needed. To accommodate your shifting needs we are available via phone when you need us, and with offices in NYC and Westchester meeting up with us is not a problem. Even though every single website is totally different in every way, we take a very strategic approach to SEO. Based in NYC, but with a global client base we have the team and experience to provide you with SEO services that produce results. We understand SEO, search engines, marketing, consumer psychology, conversion optimization, and worked with enough businesses to understand how to tie it all together to achieve the best outcomes for our clients. You get massive experience and creativity the second you work with us! We also understand that many of the customers we serve may be in dire need of results and this may be there last chance at keeping the doors open, and that is a major motivating factor that keeps our wheels spinning night and day. With the power of Search Engine Optimization, and a team of SEO experts like ours you will be able to drastically cut your pay per click and other paid search expenses and realize better results provided by organic search results. Local SEO may be the most important two words you’ll need to know. Call us to learn how our New York City SEO company can grow your business and increase online exposure here in NYC. We will develop a custom local SEO strategy to have you not only get on the first page of Google, but dominate the NYC search market with multiple first page results! And YES we can show you many customers we’re already doing this for. We will also review and discuss providing you a business listings report which will submit and index your business on many of the leading search engines, local websites, and mapping apps that reach 150 million+ potential customers monthly. Making sure your business listing pages are all setup properly and optimized is also critical to your online local SEO success. If you haven’t figured it out by now SEO is time consuming and critical to the success of your business. It takes care and knowledge of best practices to make sure your online efforts are helping not hurting you. To learn more about our local NYC SEO services, why 10Tier.com has been a leading SEO company in NYC since 2004, and how we can assist you with all of your SEO service needs please email us today. To speak with a NYC SEO Expert now give us a call at 1-800-543-1276, 7 days a week, between 7am and 9pm EST. We’re your New York City SEO Company that can help you organically dominate the 1st page of the search engines for your area!